Compact, clump-forming, with fleshy, rounded to kidney-shaped, lobed leaves, strongly red suffused and dark claret-red underneath, on deep red stems. Panicles of small, star-shaped white flowers in autumn. May be semi-evergreen or deciduous. Moist, well drained, humus-rich soil in part shade. Will tolerate deep shade. Irregulares group. 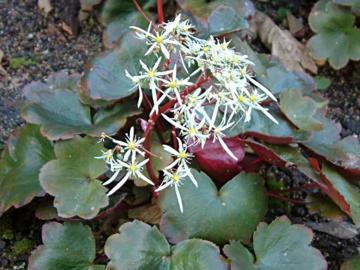 Saxifraga fortunei hybrid.